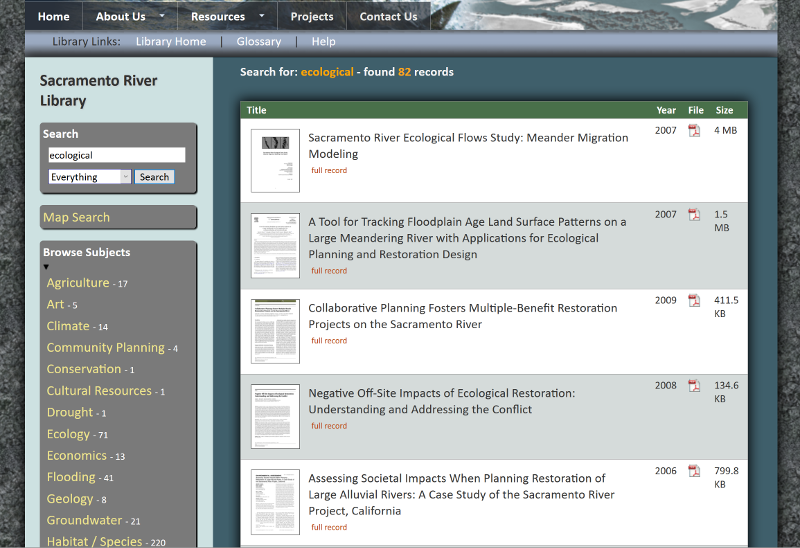 The Sacramento River Library provides access to a growing collection of information about the Sacramento River. The library can be searched to locate documents, maps, photographs, and data on many topics such as restoration, fish habitat, agricultural issues, and hydrology. 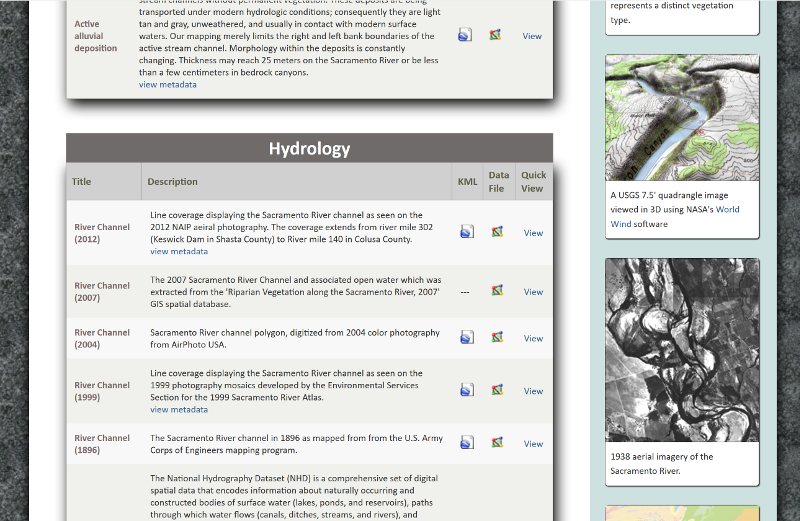 The Sacramento River Geographic Information System is a resource for spatial data for the Sacramento River. It is intended to help with locally based decision-making, assisting in understanding and analyzing land use and vegetation patterns, flooding, erosion, and channel dynamics on the river. 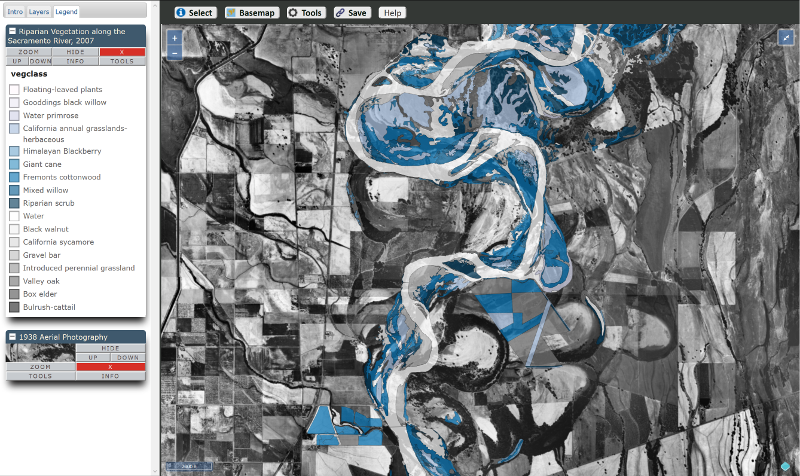 The Sacramento River GIS Viewer is an interactive map to load, view, and manipulate GIS data for the Sacramento River. You can also save and share your map with a link like this map. Additional tools allow searching for places, measuring areas, and downloading data. The What's New? page is a source of recent news, updates, events, and announcements of interest to people working on issues related to the Sacramento River. Links to PDF documents external websites are provided for each news item. 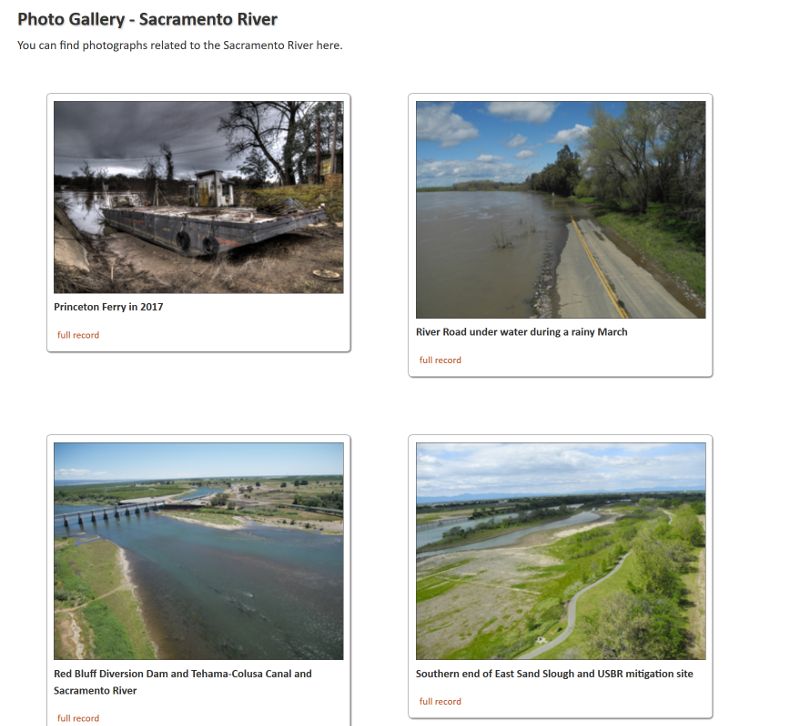 The Photo Gallery is an easy way to view and search the Forum's collection of photography of various aspects of the Sacramento River. 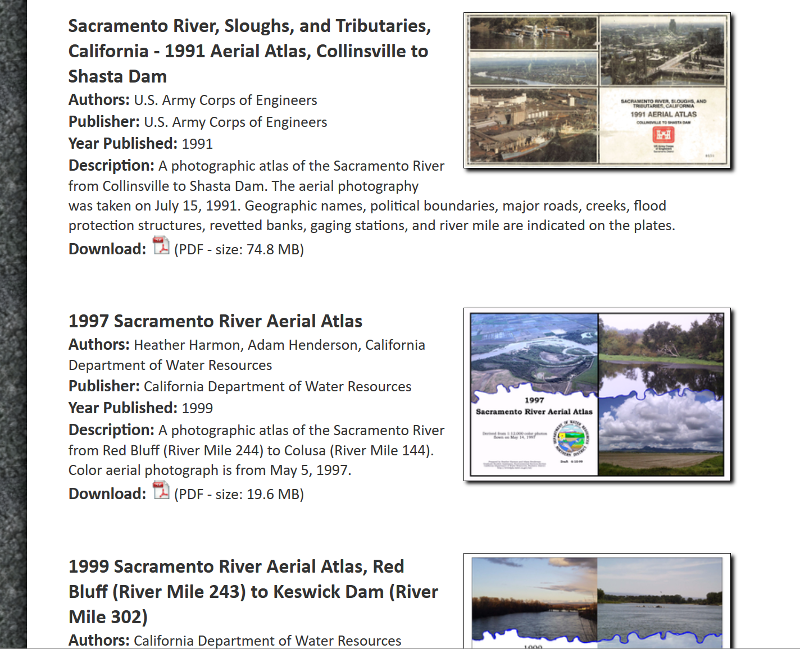 The Atlases of the Sacramento River webpage provides access to a collection of various river atlases produced from 1978 to 2004 by various state and federal agencies. 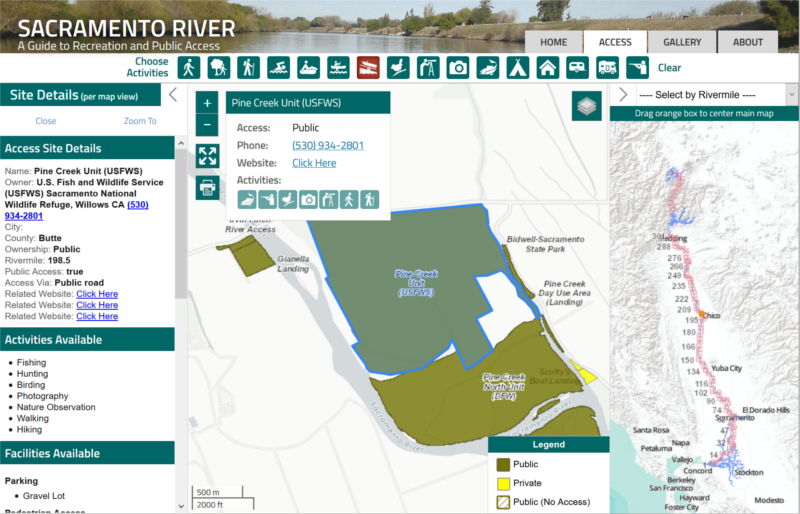 On this website hosted by the GIC, you will find ways to access the river along its entire extent from Suisun Bay to Lake Siskiyou.The Sacramento River provides a wide range of recreational opportunities. 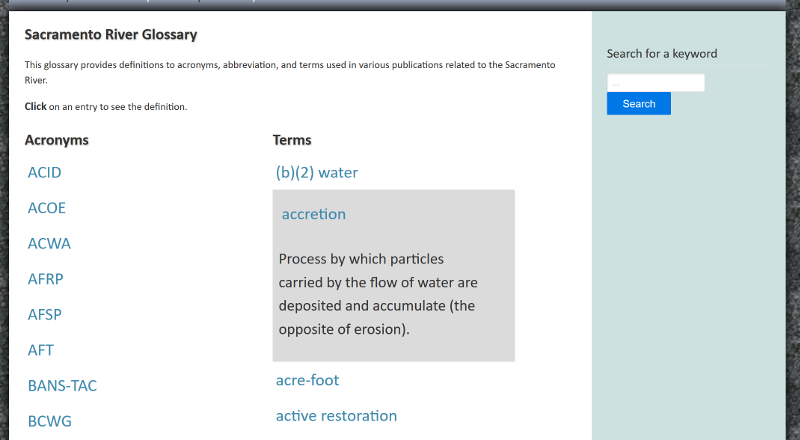 The Sacramento River Glossary is a quick way to find the meaning of an acronym or specialized term one freqently encounters in publications relating to the river. 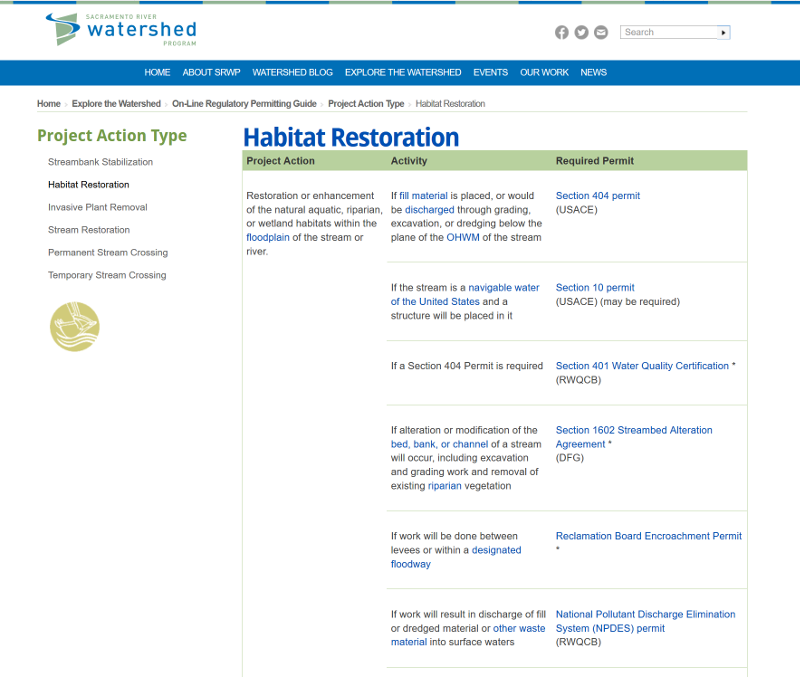 The Sacramento River Watershed Program provides an on-line regulatory permitting guide designed to help project proponents determine which permits may be required for certain project activities. For example, what permits would you need if you were proposing to remove invasive plants (weeds) or conduct bank stabilization? This permit guide will assist you in determining which permits you will need for the specific activities you propose to conduct. The Sacramento River Clearinghouse: The guiding principles of the SB1086 Riparian Habitat Management program call for sound resource management based on knowledge about the river and the regulations governing its use. 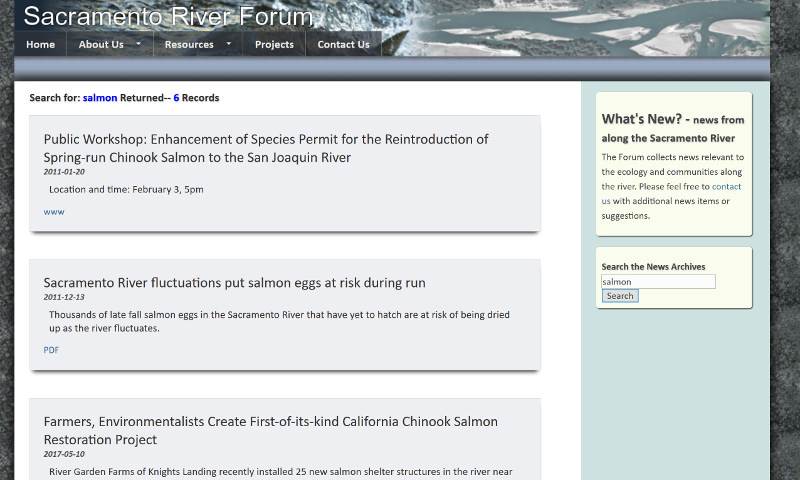 The resources provided here are part of a growing clearinghouse of information on the Sacramento River.